I was having a conversation with my mom last week about how my grandma used to color eggs back in the days. I don’t have exact memories of how my grandma went about the coloring but I do remember big pots boiling on the stove with the eggs in them. My mom told me that my grandma used to find colored cloth that bled when washed. She then would sew the egg in the piece of cloth and drop the whole thing in a hot water. I thought wow, what a brilliant thing to do! My grandma was indeed one hell of a clever lady, I tell ya! I have to confess that I am not one of those people who has fond memories of sitting around and painting eggs growing up. Yap, I don’t because I didn’t really do it. 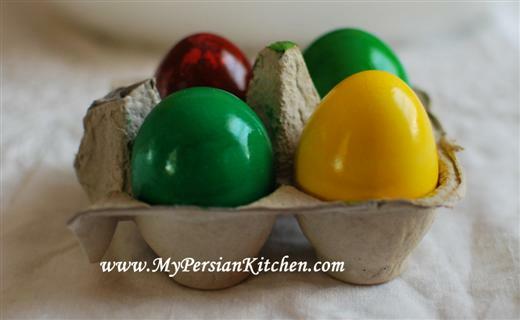 In recent years I took the easy way out and put egg shaped candles on my Haft Seen. But this year, since I knew I would be talking about Half Seen, I decided to give it a go and do some egg painting. Here are the cast of characters. I love these little egg coloring cups. They make everything much easier! 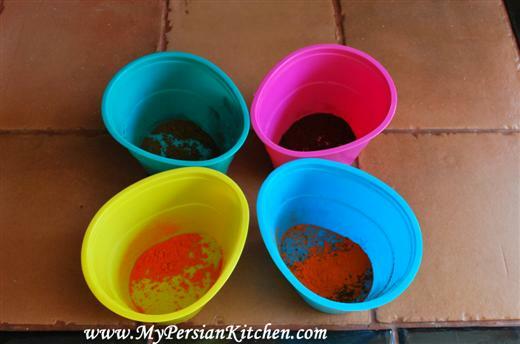 I bought the dye packets from my local Persian grocery store. The eggs must be hard boiled and cooled before you start. Place the dye in the cup. I somehow neglected to buy blue so I thought I would mix green and yellow to get a different shade of green for my forth egg. 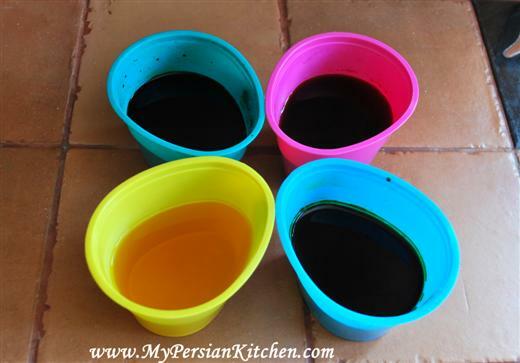 Add water and 1 tablespoon of white vinegar. 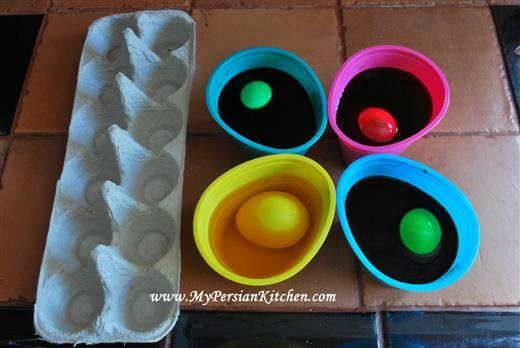 Drop in the eggs and let them soak until they turn into the desired shade that you are looking for. The longer they stay the darker they get. 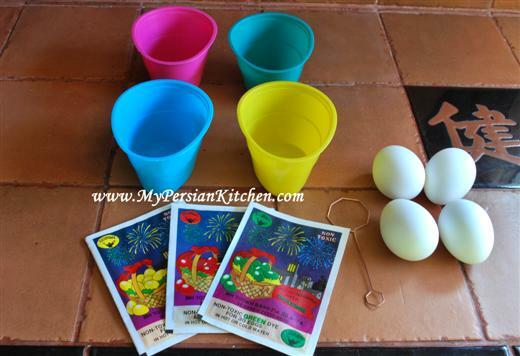 Drop the colored eggs in the egg carton and let them dry. 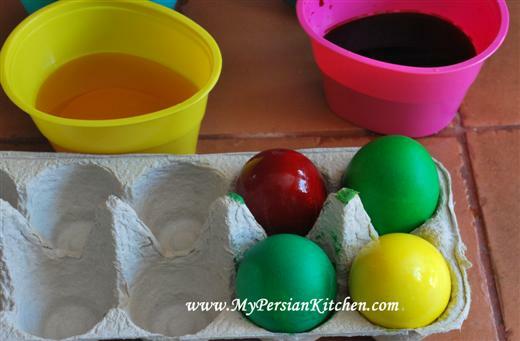 Once the color has dried, place some oil on a cloth and rub all over the eggs to make them shiny! I think I might be all into this now…granted it was a little messy but the possibilities are endless now!! In Poland, we are doing the same for Easter. Of course, some people make real art of it. For me unbelievable is when they make it with empty egg’s shell. Wow! Mirosix, i totally agree with you! I think I might have do some experiments on my own and see what happens!!! In the jewish sephardic version, for Passover, my grand-mother cooked the eggs with onion peels, water, oil, a little ground turkish coffee. 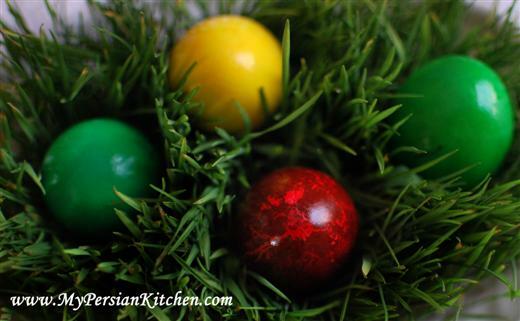 If the egg break during cooking, the white gets a beautiful pattern. Thank you for the information. I am going to use your instruction for the next Eid inshaallah.